As of July 29th, 2001, we have the following results. A very special thanks to all of you that have voted, let alone finding the site in the first place. You can learn more about this historical band and check out their current staus, schedule and the works, by visiting their website with the link below. I saw them once at the Red Garter Saloon in Cameron Park, California. 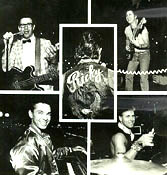 They played as Ricky & The Redstreaks. Bruce was there acting as a DJ while the band was on break. It was a great time back then. The only problem..? Drinks at the Red Garter were always watered down, and you had to spend a small fortune to taste the liquor. Another time I saw them at the Candlerock Lounge in Carmichael, by Tower Records off of Watt Ave. and El Camino Blvd. I also heard that they used to play at the El Dorado County Fair and even played as both bands. If anyone has any photos of that I would love to have a copy. Hi! Cruising the search engines and found this web page on us, this is funny! Actually u can can find everything about us at our web site. Hello there! Ricky and the Redstreaks are alive and well. They will be playing at the Reno Rodeo in June. Two of the original 4 members are still with the band. John Jackman(aka Ricky) and Ray Brown (Daddy-O).I went to school with both of those guys at Ponderosa High School in the late 60's...! I will never forget the battle of the band at the 1968 El Dorado fair grounds in Placerville, CA my brother played in a band that competed also in the battle infact he knows Jan (with his hot rod cars), one of the orginal members of the train. I also remember the Angels camp days when the Train played there. Then, when I worked at the Candlerock lounge I saw one of their sets, it was called Ricky and the Red Streaks, I will never forget that night, I was under age and I had to sneak in from the back door to the kitchen. A couple of years ago I saw them again in Vegas, they are better then ever ! !